On Wednesday, The Center for Medical Progress released its latest undercover video, in which a former Planned Parenthood abortionist (who now operates her own facility) admits to killing 24-week-old babies. In the video, DeShawn Taylor, the medical director emerita of Planned Parenthood Arizona and a former abortionist at Planned Parenthood Los Angeles, casually admits to performing elective late-term abortions and even goes so far as to explain the “technique” she uses. “I go up to 24 weeks. … Most of my – most of the patients that come to me are elective,” Taylor said. While Taylor may be aware of her weekly abortion schedule, is she aware of all the babies who are born at 24 weeks gestation and survive, even when odds are stacked against them? Stories like Francesca’s are proving that late-term abortion prevents viable babies from having a chance at life. PIC FROM MERCURY PRESS (BABY FRANCESCA BRADLEY-CURRAN 24 HOURS AFTER SHE WAS BORN PREMATURELY) Meet the premature miracle baby whose feet were the size of a PENNY when she was born just two days after the 24-week abortion limit. Baby Francesca spent 17 weeks in the hospital, hurdling many obstacles, including blood transfusions, meningitis and sepsis, collapsed lungs, eye surgery, and kidney problems. On account of her premature birth and overcoming many difficult battles, Francesca shows us that babies born early have a winning chance at life. Another story tearing down DeShawn Taylor’s callousness for preborn life is that of Baby Amari. Doctors weren’t sure if Amari, born at 24 weeks and weighing just 15 ounces, would live. “I didn’t think a 15-ounce baby had hope,” Rodericka Moore, Amari’s mother, said. “I didn’t think a 15-ounce baby could be normal, could come home on no oxygen and no feeding tubes.” Yet little Amari proved even his mother wrong, surviving like a champ. Other stories of premature births at 24 weeks include babies Marlo, Sebastian, Elsie, and Adelaide. It was once thought that 24 weeks gestation marked the viability of a preborn baby. (Even Roe v. Wade recognizes this.) Since time and science have progressed, however, we now know that viability can be much earlier. Take for example baby Abiageal. 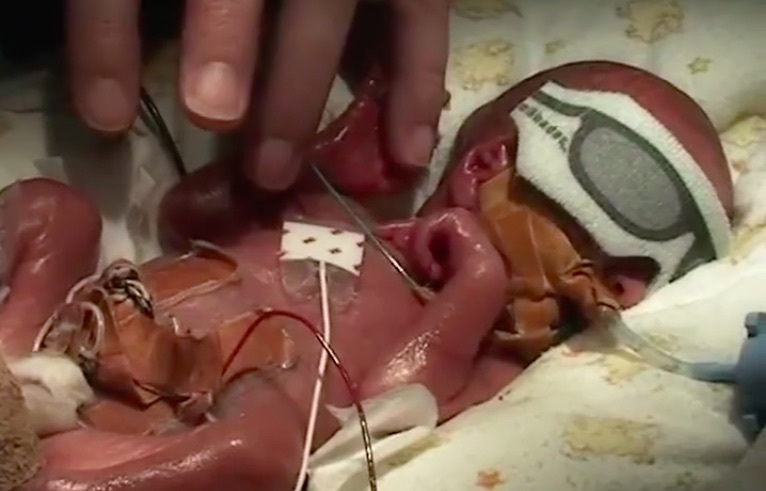 In early March, LifeSiteNews reported on the story of Baby Abiageal, who was born at just 23 weeks. After being born extremely early and surviving a major abdominal surgery, Abiageal shows the beautiful results that can come from saving premature babies. Louise Peters gave birth to her beautiful girl, who weighed only 1.3 pounds. After experiencing a serious complication with her intestines and going through surgery, Abiageal beat all odds against her. “We only chose to operate because her chances of survival without surgery were so small,” Zahid Mukhtar, Abiegeal’s surgeon, said. For other stories of premature babies born before 24 weeks, see Baby Trevor, Baby Eirianna, Twins Imogen and Annabelle, and Baby Juniper. Taylor’s unwillingness to help even viable preborn babies survive shows us that Planned Parenthood’s motives are focused not on women’s health care. The Abortion Corporation is focused on exactly that: abortion at all costs.